All held in our venue in North London on Mondays, Thursdays & Saturdays. Same skills class each week. Choose either Trapeze, Straps, Hoop, Rope or Silks. Choose the day. This is not valid for different or another class from week to week. Skills Class starts Either Thursday 25 April or Saturday 27 April for Aerial Skills class. Aerial Conditioning dates: 29 April, 13, 20 May, 3, 10, 17, 24 June, 1, 8, 15 July. Includes Aerial Days Tshirt & Free practice times. Includes 1 free practice time. Same day, same skill each week! 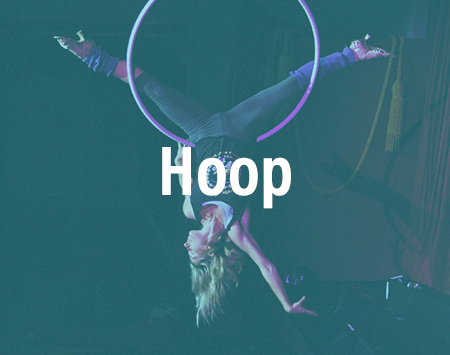 Choose your skill Hoop, Trapeze, Silks/ Rope or Straps and the day either Thursday or Saturday and book online! 12 week course includes 2 practice times. Thursdays 715pm - 845pm, 25 April - 18 July, no class 30 May. Saturdays 1145am - 115pm, 27 April - 20 July, no class 1 June. 6 week course includes 1 practice time. Thursdays 715pm - 845pm, 25 April - 6 June, no class 30 May. Saturdays 1145am - 115pm, 27 April - 8 June, no class 1 June. For Absolute beginners who want to learn silks. We will use silk loops and hanging silks to learn the basic skills. We will learn climbs and how to invert starting from the ground and then moving into the air. 24 April - 5 June, no class 29 May. Get fit using the Aerial equipment, Rope, Silks, Trapeze, Straps, Hoop and floor and partner conditioning exercises. Concludes with Stretch and Flexibility. Mondays 7.15pm - 8.45pm, 29 April - 15 July. no classes 22 Apr, 6, 27 May. Mondays 7.15pm - 8.45pm, 29 April - 10 June, no classes 22 Apr, 6, 27 May. Give an Aerial Days class as a gift for an active or Aerial curious friend! They can choose when and which of our scheduled classes to try. We recommend Trapeze, Hoop or Aerial Conditioning for a brand new Aerial Student. For experienced Aerialists they can also choose from Straps, Rope or Silks. The gift vouchers can be for one or two of our Aerial Days classes. Gift Vouchers are available for use by new clients only and valid for 4 months. Use the 'Book a class' or 'Book now' button to make your purchase. Or contact us for your preferred number of classes and we can make a voucher to suit you! If you would like to bring a group for your own Aerial Days Workshop on a Saturday or Sunday go to our workshop page for more details. The classes start with the group led warm up, including core and body conditioning. We warm the body, mobilise the joints and get ready for aerial work. Bodyweight conditioning is used at the end of the warm up to strengthen and support the body for aerial work. Repeating the shapes during conditioning, first on the floor as a group and then onto the aerial equipment, will help students become familiar with the shapes needed to be performed in the air. During the skills part of class, students first learn basic moves using the body shapes they practiced on the floor. In later classes, as skills develop, students will learn how to add more complexity to progress these first moves into more challenging skills. Eventually the students will link some of these skills and moves to create sequences and routines that may be shown to the whole class. We conclude all classes with a cool down, focusing on flexibility and release. Adult classes are suitable for many levels of ability and ages 17 up. Classes are mostly general experience level except when marked beginner or intermediate Two people are needed to run each class with a maximum of 6 people in each class, 4 people in Straps class. **Limited places available each day for '1st Class' half price offer. Not valid for Practice time. See the FAQs for information on which class may be most suitable for you. Places for Practice Time may only be released on the day for Thursday and Saturdays as classes have priority for the use of the equipment. Monday is bookable in advance. The practice time session is for our students who are competent to work unsupervised or aerial students who can demonstrate competence and safety in the air. This includes an effective warm up and practicing only moves they have been taught and are competent with. As it is an unsupervised session we ask you not to practice unknown skills or to teach others. We would like to know that you are suitable to practice alone. We may want you come to a class so we can assess your level before clearing you for practice time. The practice time is space and time to practice when we are running our own classes. Check with us that there is room for you before coming. Also called Static Trapeze. A 50cm long metal bar, with 2 cotton ropes attached to each end and hung from the roof. This is a non-swinging apparatus where the trapeze bar provides a seat on which moves, poses and drops can be done. The trapeze bar height is anywhere from 1.5 – 2.5 metres off the ground. All skill levels can be accommodated in trapeze, with new students needing no previous experience. This is a faster paced Trapeze class. In this class students will be working on more complex moves, linking more moves together and working on higher bars. Students should feel confident to safely challenge themselves. Beginner level students are able to join this class but should contact us to discuss their suitability. Absolute beginners and beginner or improver students are best suited to this class. This class is for students early in their aerial training. Students will learn how to get on and off of the bar safely.They will learn beginner level root moves which are taught seated, standing and hanging underneath the bar. The moves have names such as gazelle, half angel and amazon. As the students' skill grows, they will learn to link 2-3 moves together and work more confidently standing or using strength moves. General level students are able to attend this class and will work on more complex moves and transitions. Also known as Cerceau or Lyra. This is a circular shaped solid metal ring around 90-100cm wide with one (sometimes two) hanging points on it. It is suspended from the ceiling at various heights. Moves are performed around, in and on the hoop. The hoop can be static, spinning or swinging. Students will learn how to get on and off of the hoop safely.They will learn beginner level root moves which are taught seated and hanging underneath the bar. The moves have names such as gazelle, man in the moon and amazon. As the students' skill grows, they will learn to link 2-3 moves together and work more confidently inverting or using strength moves. This class is suitable for beginners as well as more advanced students. Students will learn how to get on to the hoop and learn to descend safely. Many beginner level moves are taught seated and hanging underneath the bar from different parts of the body. The moves have names such as man in the moon, fish and back star. More experienced students will work on developing transitions into sequences and routines. Moves will become more complex and involve a more dynamic and confident movement quality. Also known as aerial straps. These are two polyester or cotton covered pieces of nylon webbing with loops in the bottom for hands or feet. These are around 2.75m long and have swivels attached at the top. Moves are performed form underneath or with the straps wrapping around the body. Straps work focuses on strength and dynamic based movements. This class is more enjoyable when the student has experience with trapeze, hoop, silks, rope or a similar physical skill, as aerial awareness and good upper body strength are required. This is a challenging and rewarding class with a maximum of 4 students. All levels of straps students can be accommodated and challenged in this class. Also known as Corde Lisse. A single 35mm wide, 7 - 8m soft cotton covered rope in length, suspended from one point in the ceiling. 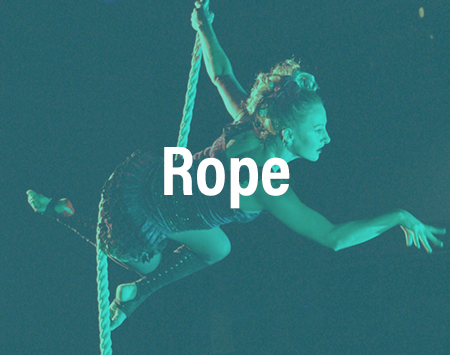 Moves are performed up and down the length of rope making postures, drops, wraps and tricks. Most moves require significant upper body strength and a developed aerial awareness. Also known as Tissu or Fabric. The silk is a long piece of medium stretch fabric which is folded in half, thereby giving two lengths of fabric. The two halves are used to climb and wrap the silk around different body parts to make shapes and perform moves and tricks up and down the length. Most moves require significant upper body strength and a developed aerial awareness. This class is for those without aerial experience, who would like a slower introduction to learning silks. We will adapt the silks so we can work from the floor and build strength and aerial awareness at a more comfortable pace. You will work in a loop, learn climbs and do aerial skills and exercises in a safe, fun and comfortable environment. This class is more enjoyable when the student has experience with trapeze or hoop or a similar physical skill, as aerial awareness and good upper body strength are required. Students choose either rope or silks but can try both. Students in this class learn many different climbs and variations of beginner moves. We work low to the ground first before trying things at height. New students will enjoy this class more if they are able to invert safely on the ground and hold some body weight. This class is not recommended for new aerial students. Students choose either rope or silks. In this class we will be working with transitions, sequences and more complex and dynamic moves. This may include swings, drops and creating routines. 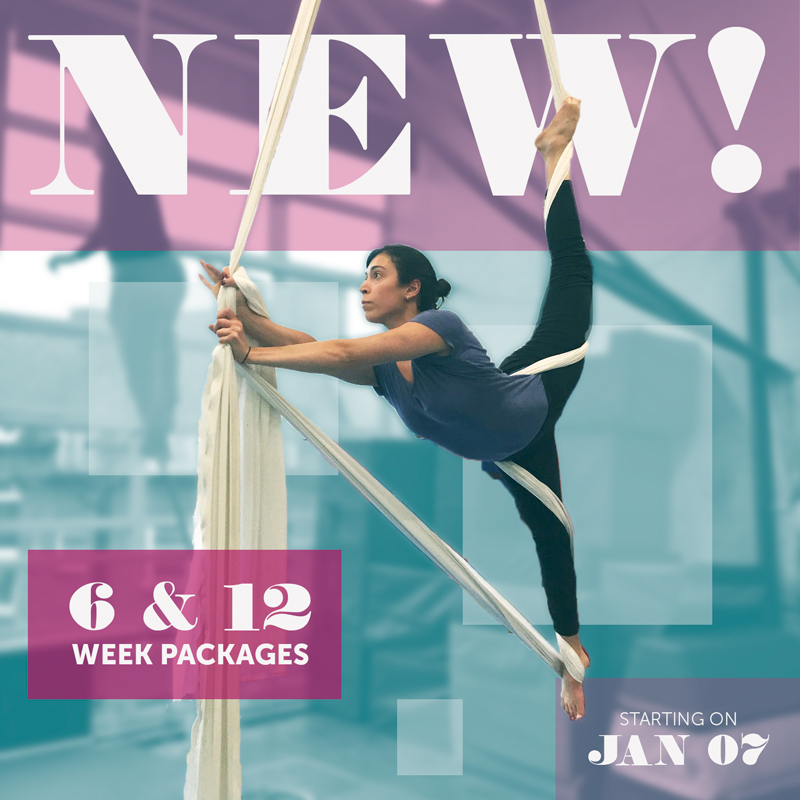 New students should be able to invert safely at height, be able to confidently link moves together and understand basic rope/silks skills to join this class or have spent at least a year or more doing trapeze, hoop or another aerial skill to a good level. This class is suitable for all levels of aerial students and budding aerial students. It can be a support to your aerial training or as a stand alone class! It focuses on body conditioning using the aerial equipment (trapeze, hoop, rope, silks) and floor exercises. The class includes a warm up, and concludes with stretching and flexibility training. Each person works at their own level with 2 teachers in this session to guide you towards a suitable variation of the skills. We recommend practicing the floor skills learned in class at home too! The focus during conditioning, is on the quality of the aerial exercises. We want to guide you to develop your aerial strength in a supported and controlled environment. We hope to increase your understanding of why you are doing each exercise, as you build your strength for aerial work or just for the summer! The flexibility training is essential for all the muscles in your body to help prevent injury, help heal and relieve tightness as well as develop long term flexibility. Increasing the range of movement can increase blood flow to the muscles, enabling them to work more effectively. Active and passive stretching exercises are used to improve the students’ range of movement. We may stretch alone and use assisted stretching techniques with a partner.